3 gel capsules per day, with a meal. 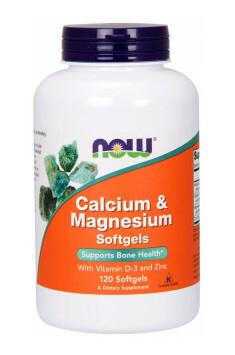 It is important to choose a supplement, wherein the ratio of calcium, magnesium is 2: 1. Use of the product is best combined with the formulations of vitamin D and vitamin K for the prevention of bone disorders. Standardized plant extracts, supporting hormonal balance in women. Zinc oxide is a binding of oxygen with zinc in the II oxidation state. It is one of the forms used in dietary supplements. Zinc is a mineral with a very wide range of effects on the human organism. Among its properties is, for example, the beneficial effect on the condition of the skin, especially helpful for people struggling with acne. Men appreciate zinc for its ability to increase testosterone levels and reduce oestradiol, which is possible thanks to aromatase inhibition. The mineral is also beneficial for the thyroid gland, as it can help to increase the level of hormones FT3 and FT4. The neurological aspect of zinc’s activity is also very interesting. It has the ability to block the access of glycine to the NMDA receptor, and the initiation of ion flow in the receptor becomes impossible for glycine. Thanks to that, zinc can protect neurons from the excitotoxic activity of glutamate. It also contributes to the growth of the brain-derived neurotrophic factor (BDNF), which can be beneficial for cognitive functions and reduce the risk of depression. Zinc oxide can be found in vitamin and mineral complexes offered by muscle-zone.pl.